A game jam is a gathering of people for the purpose of planning, designing, and creating one or more games within a short span of time. When and where is the Civic Game Jam taking place? The third Civic Game Jam is taking place on Saturday, 18 November, 2017, from 10m to 10pm. The location is the UE / BTK University of Art & Design in Dessauer Str. 3-5, 10963 Berlin (close to Potsdamer Platz). Is the Civic Game Jam a competition? No. There will be no judges, no voting and no prizes. Is there a fee to pay to participate? No, the event is free! But but since a limited number of spots is available, an application is required. Do I need special skills to participate in the Civic Game Jam? No. 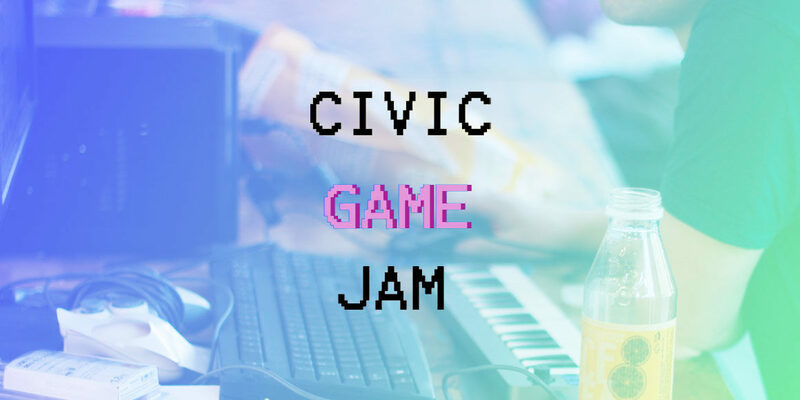 Designers, developers, artists, activists and everyone else is welcome to make a game during the Civic Game Jam. Which tools should I bring? We will provide rooms, tables, chairs, internet connection and drinks. Everything else is up to you, including food – there are some cafes closes to the venue where you can buy something to eat. Isn’t 7 hours a little short to make a game? It’s definitely not easy, but it’s possible! Have a look at the games made during the previous two Civic Game Jams to get an idea of what to expect in terms of final results: Civic Game Jam #1 (theme: Nature), Civic Game Jam #2. Please write an email to vf (at) 2084online.com.